When drummer Malcolm Wright left the group in 1968 he was replaced by a number of different drummers whose names are uncertain. Names mentioned are Martin Harrison and Derek Cashin. In the picture on the left can anybody help put a name to this drummer last on the right. His name was Martin Harrison, he stayed on in Germany with Gary he's probably the one to ask for more details. The "Hi-Fi´s" from London did a hot show during the last week in "Bonanza" *. The five London "rock´n´roll"-freaks made something happen that no other band before ever could: the dance-floor stayed empty!! But not because their music was too bad for dancing, no - the "Bonanza"-guests were so impressed by The "Hi-Fi’s" musically outstanding performance that they totally forgot to dance ! 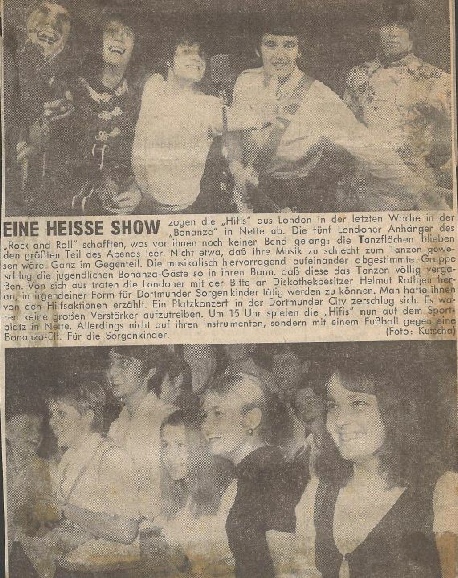 The "Hi-Fi´s" asked club-owner Helmut Rath if they could do something for an organisation called "Dortmunder Sorgen-Kinder"**, because they’ve heard about it. A gig in Dortmund-city was cancelled, because there were no big amps available. at 3pm The "Hi-Fi´s" played outside - not with their instruments but with a football vs. a "Bonanza"-team. for the "Sorgenkinder"